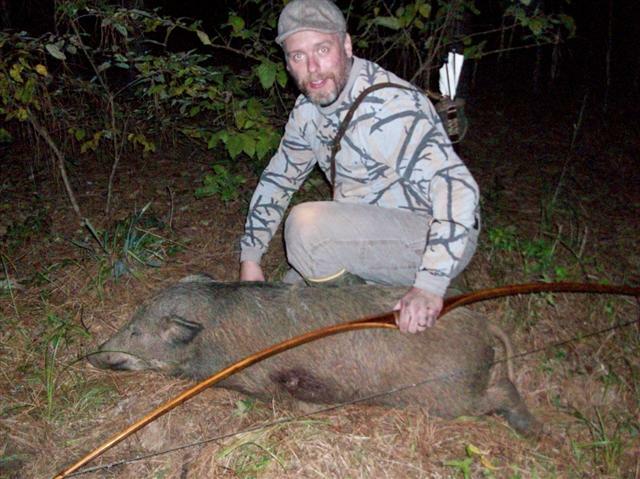 I took this wild boar on November 3, 2009 from a treestand right at dusk. He came in with many other hogs and presented an opportunity for a shot at 15 yrds. Recovery distance was about 70 yrds. Equipment used: MR Hamilton/Scorpion longbow built in 1989, ELITE cedar arrow, Woodsman Elite Broadhead and woody weight (100 gr. ), High Noon Hunter Quiver. I was sick with a cold, but I am glad I went hunting in spite of it.